A lot of times for work, I will take the long way back to US-131 if I’m on the northeast side of Kalamazoo. It seems like it’s just easier to go down Douglas Avenue and hit the highway from D Avenue instead of taking the BL….well, that and sometimes, I’m just killing time. 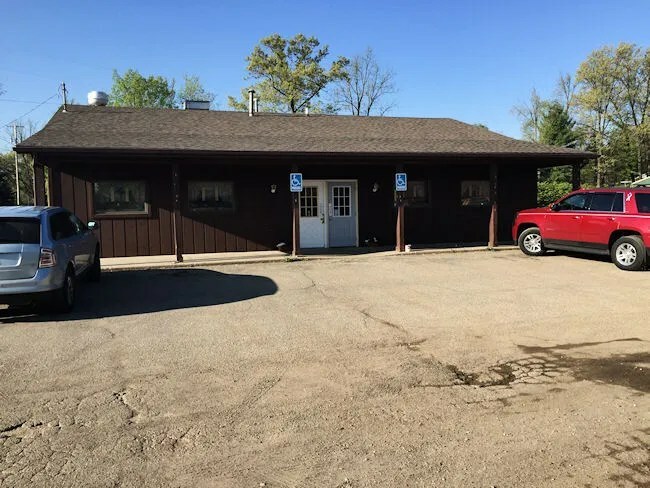 On that drive back to D Avenue, I’ve passed a little restaurant sort of in the middle of nowhere in Cooper Township. It’s always closed as I typically drive that route at night, but I had to get up with the kids one morning earlier this week and head in that direction. L had a school field trip at DeLano Farms on West E Avenue in Cooper. B always gets me up early and we’re kind of habit forming on school days. I like to get out of the house a little after 8:00 to get L to school by 8:30. The field trip wasn’t until 9:30 and, being a preschool, parents had to provide transportation. I decided not to ruin our routine and got the kids out of the house by 8:00 with the intention of going to breakfast. Cooper Cafe is on Douglas just south of D Avenue in what can only be described as the business portion of Cooper Township. The Township Hall and fire station is just around up the street on D and the area’s only grocery store sits right at the corner. We pulled in to a very rough parking lot that was quite full. Cars were parked all the way around the building leaving me no choice but to park on the perimeter and navigate a 4-year-old through the very deep muddy puddles left from yesterday’s rain. Cooper Cafe has been in the area for over 20. It’s clearly a pre-smoking ban building with two distinct seating sections although there would have been no actual separation between the two in days when you could ruin other people’s meal with your selfish habit. The space is pretty dated with decor and furniture that is probably original to the business. All seating looking to be tables and there was even a small lunch counter near the kitchen for the solo diners who didn’t want to take up a table. I spotted a table in the back corner that was open and I pointed L that way. The tables are a little close together so I squeezed B on to a chair by the wall and sat next to him and had L sit across from me. She wasn’t in the best mood and didn’t really want breakfast, but she started building a city out of the jelly and coffee creamer’s on the table and forgot quickly that she didn’t want to be there. A waitress noticed us sit down and came over with menus. At that point, I ordered a Coke for myself and a glass of water for L out of habit. I meant to ask her if she wanted milk but we’ve always just ordered her water and that’s what I did. She didn’t notice and drank the entire glass before our food even came out. When the drinks came back, I had had enough time to look over the menu. L kept saying she wasn’t hungry and I couldn’t find a kid’s breakfast menu anyway. 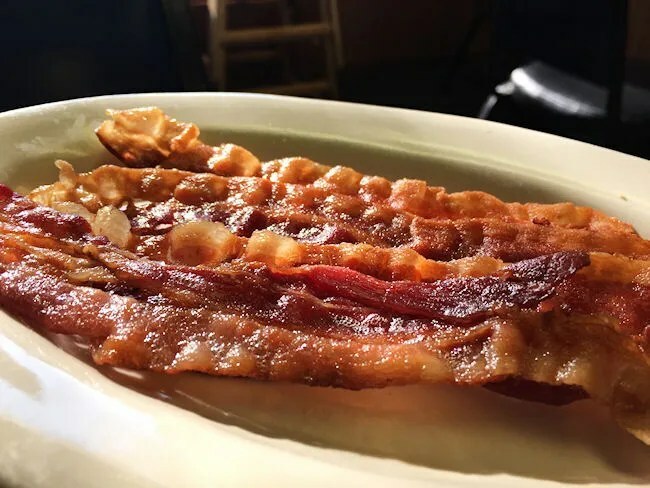 I just ordered her a plate of bacon. I was going to get a pancake too, but she did have some yogurt before we left home and it’s not always a given that she’s even going to eat in a restaurant. She was already fighting me on even going out to eat that I didn’t feel like fighting or wasting the money. Turns out, she was hungrier than she thought. She argued with me all the way up until the waitress brought her plate out, but once there, she ate all four pieces of bacon and was asking for my toast. I gambled the wrong way on this one and should have probably ordered her something else. As for myself, I ordered the Steak & Eggs. 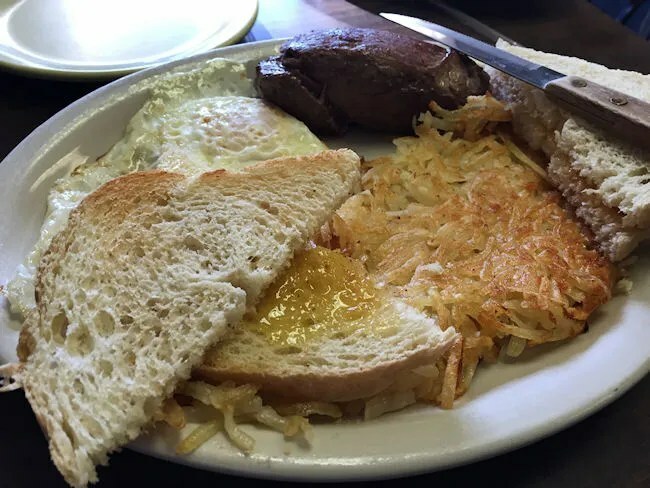 This classic breakfast plate comes with two eggs, steak, potatoes, and toast. By the time our food arrived, B was sitting on my lap. He does this really loud screeching thing when he’s happy and playing with his toys. J calls him a little pterodactyl….it’s LOUD and very high pitched. Even though it was a happy noise, I didn’t want to bother others around us, so I took him out of his car seat. That makes cutting a steak a little tough. With that little challenge, I started with the hash browns first. They were very crispy on the top, but soft and fluffy throughout. They had a little bit of a greasy/salty flavor to them which was delicious. The plate was about half potato and I was alright with that. They weren’t the best hash browns I’ve ever had, but they are right up there with the better ones. I tackled the eggs next because, again, I could easily do it one handed. The two eggs were a perfect over medium with a runny but somewhat solid center. Now it was down to bread and steak. I did go for that bread next and ended up sharing a piece with L. I stuck with white bread and it came with a thick coating of liquefied butter. I thought it was very tasty and surprisingly, so did L. She doesn’t typically eat anything on toast, but she asked me what it was and then still ate it. She said it was good and that’s how she likes toast now….we’ll see if she remembers. Now there was nothing left but the steak staring back at me. I had cleaned the rest of my plate so I could bring it closer to me. B had been trying to stick his hands in all of my food so I had pushed the plate away so he couldn’t reach it. He’s not eating food yet and I really didn’t want to deal with a mess if he got something in his mouth. The steak was a small, thick piece of meat that had a good sear on the outside, but a perfect pink ribbon in the middle. It was juicy and tender, but needed a little more seasoning. Some salt and pepper would have given that sear a lot more flavor. It was good the way it was, but the potential was there for this cut to be a really good breakfast steak. The bill for our breakfast was just over $13 with the bulk of that being my Steak and Eggs. 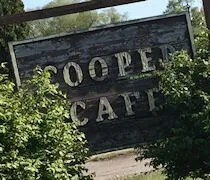 Cooper Cafe is a great little country cafe. Almost everyone in there seemed to be a regular and it’s the kind of place where people just sit around and shoot the breeze over coffee. We were a little early, but on Wednesday and Saturday mornings, they even have a bluegrass band that plays during breakfast. L would have loved that, but the band started the same time as her field trip, so we had to bail. I grew up in a small town and all of the restaurants around me where little country diners like this. Cooper Cafe isn’t fancy, but it is comfy and it is good. It has all the things you’re looking for in a breakfast joint outside of the city.